The John Silber Early Learning Center, or Shurtleff School, was put on a heavy lockdown Wednesday afternoon after police responded to shots fired on Congress Avenue. At 1:30 p.m., the ShotSpotter system triggered at 101 Congress Ave. near the school. Police discovered one man in the area who was hiding shortly after the incident. He was found to have a replica firearm on him and was taken into custody. However, later, witnesses said he had not been the shooter, but rather the intended victim. Chelsea Police are looking for additional suspects. Police were stationed at the school during the lockdown, and things were soon restored to normal. School was released by 2:30 p.m. 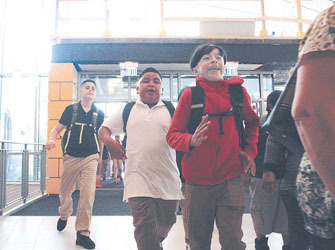 Excited middle school students at the brand new Clark Avenue School ran in the front door as the 8:05 a.m. bell rang and the new school opened up. The new Clark Ave fully opened to students on Wednesday morning, Aug. 29, bringing phase 1 and phase 2 together – complete with a new gym, a new music room and an exciting outdoor courtyard space. Excited parents, students and school staff gathered in the new courtyard before school started – buzzing with excitement over having a new term start in a new building with all of the amenities. Live racing and simulcasting have been suspended at Suffolk Downs and all other horse tracks and betting facilities in the state due to the fact that the State Legislature did not act to renew the Simulcast Bill before the end of its formal session at midnight on July 31. 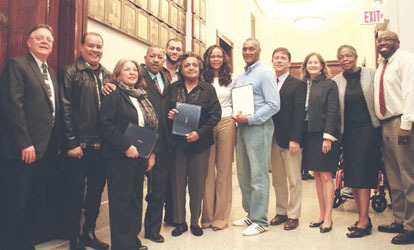 The Chelsea Trailblazers were honored on Monday, Feb. 26, at the Chelsea City Council. The Trailblazers award was given as part of the Black History Month celebration, and a celebration for them was given on Wednesday, Feb. 28. Pictured (L-R) Gerry McCue, Daniel Cruz, Joanne Lee Nieves, Councillor Leo Robinson, Shaquor Sandiford, Betty Boyd, Joan Cromwell, Johnnie Lee, Joe McNamee,Shelagh Mahoney, Sharon Caulfield and Dakeya Christmas. The Chelsea High boys soccer team turned in what CHS assistant coach Evan Protasowicki termed “our best game of the season” to earn a 2-1 victory over Northeast Regional Vocational School last Thursday on the turf at Chelsea Stadium. “We played a full 80 minutes against an excellent Northeast team,” said Protasowicki of the Red Devils’ performance, for which a large crowd of Chelsea supporters were on hand for the battle with the Red Devils’ perennial archival. The Chelsea victory avenged an earlier loss to Northeast at the beginning of the season and gives the Red Devils a good chance of capturing the championship of the Large School Division of the Commonwealth Conference. Chelsea drew first blood 10 minutes into the game when senior defenseman Carlos Arevalo made a nice run up the left sideline, dribbling past a Northeast player and keeping the ball just inbounds along the sideline. Barahona one-timed a perfect shot into the back of the Northeast net. The teams battled evenly over the rest of the half, leaving matters at 1-0 in Chelsea’s favor at the intermission. The scoreboard remained locked-in at that reading through most of the second half, until Northeast finally broke through with 11 minutes to play to bring the contest back to level, 1-1. The Red Devils launched a furious offensive effort which paid off when Delmer Romero carried the ball into the box on the left side, worked his way into the Northeast defense, and then let go what Protasowicki described as a “perfect shot” that landed into the lower right of the Northeast net. “Delmer had a small window from a tough angle, but he made it,” said Protasowicki. Romero’s goal, coming with just three minutes remaining in the contest, caused the CHS bench and fans, the largest crowd of the season, to erupt with joy. CHS keeper Bryan Armas, who made some nice saves throughout the contest, earned the victory in net. The big victory was followed by a disappointing 1-1 tie this past Tuesday with always-tough rival Lynn Tech. Romero scored the lone CHS goal just two minutes after the opening kickoff when he buried a rebound from a shot by Jephte Marcellus, who had made some nice moves past the defense to draw close to the Tech keeper. However, despite many opportunities throughout the game, the Red Devils were unable to dent the Tech net over the remaining 78 minutes of play. Tech brought the contest to level three minutes into the second half, where matters remained until the final whistle. The tie means that Chelsea still needs some help if the Red Devils are to claim another CAC Large title. Northeast is one point ahead of Chelsea in the standings, but still has to play undefeated Mystic Valley, which sits atop the standings in the CAC Small Division. The Red Devils are set to host Minuteman Regional today (Thursday) and will travel to Greater Lowell next Thursday. The Chelsea High boys cross country team improved its record to 3-2 with a solid 23-38 victory over Gr. Lowell last Wednesday on the Red Devils’ home course at Admiral’s Hill. “It’s been a number of years since we have beaten Gr. Lowell, so this felt good,” said CHS head coach Don Fay. Senior captain Jose Leclerc crushed his previous course record by more than 30 seconds to outdistance all competitors with a clocking of 17:31. Gr. Lowell runners finished second and third, but Chelsea took the next eight places to win going away. Wuilfido Hernandez came across in fourth place in a personal record (PR) time of 18:48. Demitrius Martinez finished fifth in a season-best of 19:34. Senior captain Alex Pedrero also had a PR time, finishing sixth, and Raphael Castillo was seventh overall in 20:01. Limilson Tavares and Jazmany Reyes were one second apart, 20:09 and 20:10 respectively. Yosef Ruben and Justin Turner ran 20:12 and 20:16 to finish 10th and 11th. “We had eight runners finishing within 90 seconds of each other,” noted Fay. “That is what we have been looking for all year. If we can continue to race like this, then we have a chance at the league meet title. The boys were set to travel to Wakefield yesterday (Wednesday) to compete against Northeast and Minuteman Tech. This coming Wednesday they will journey to Essex Tech for a quad-meet with Essex Tech, Shawsheen, and Lynn Tech. The Chelsea High girls cross-country team remained undefeated with a convincing 22-38 victory over Greater Lowell last week on the Admiral’s Hill course. The triumph improves the Lady Red Devils’ record to a perfect 6-0. CHS junior captain Yarid Deras cruised to a first-place finish coming across the line 40 seconds faster than the rest of the field in her season’s best time of 22:15. Fellow junior captain Jocelyn Poste was about a minute behind in third place. After a Gr. Lowell girl came across in fourth, the Lady Red Devils clinched the victory by grabbing the next four spots and seven of the next eight. Junior Amanda Dias took fifth place in 24:29, followed closely by teammates Cynthia Mancia in 24:30 and freshman Kathy Lopez in 24:31. Marissa Rivera was eighth in 26:04 and teammates Karina Avalos, Carla Romero and Stephanie Rodriguez came home in 10th, 11th, and 12th positions to complete the scoring for Chelsea. “We had a great pack today and we ran well as a team,” said CHS head coach Don Fay. The Lady Red Devils were set to race yesterday (Wednesday) against Northeast and Minuteman Tech. “If we get by those two teams then we will have a showdown for the large-school dual meet title the next week at Essex Tech versus Essex Tech, Shawsheen, and Lynn Tech,” said Fay. The Chelsea high football team, which earned its first victory of the season this past week, 22-0 over Minuteman Regional, travels to play Mystic Valley this Friday evening. Kick-off under the lights at Malden Catholic Stadium is set for 7:00. With Monday’s holiday matchup with the Colorado Avalanche, a 4-0 loss, already in the rear view mirror, it’s time to look forward and prepare for Boston’s three-game road trip, which began last night (Wednesday, 9:30pm) in Colorado. Coach Bruce Cassidy will be looking for his team’s resiliency, especially from the youngsters in the lineup who did not display the tenacity and drive they displayed in the regular season home opener versus the Nashville Predators. The Bruins trip to Colorado affords them the opportunity in this second game of the home-and-home series, to extract some revenge after the Avalanche buried them on Garden ice last Monday. While Cassidy did not point fingers, or name names, he did stress his common litany of, “we win as a team, we lose as a team.” There were many factors in Monday’s loss which proved surprising, such as their unimpressive start which found them in a hole quickly, when Rask allowed a couple of goals that could accurately be described as ‘soft,’ the play of the youngsters who had looked so solid just three days earlier, was totally the opposite. The work of Charlie McAvoy, Jake DeBrusk, and Ander Bjork, fell short on many of their shifts. Bad choices on offense and defense by the youngsters, hurt the team, offense and defense, as they created mere chaos with busted plays that resulted in missed chances and a loss. The much needed offense of Brad Marchand was nowhere to be found in Monday’s contest, as he roamed the ice, often looking lost, and again showed the effect of not having the injured Patrice Bergeron on the ice to help him create the much needed offense. In these two games without Bergeron, Marchand has recorded two shots on net, and to make matters worse, Bergeron hasn’t skated full contact as yet, meaning his return to the ice could possibly be as early as the weekend, but likely longer, as he continues to suffer from an unexplained lower-body injury incurred during training camp. Torey Krug did return to the ice, but obviously will still need time to find his strength and rhythm. Adding the loss of Bergy to an injury list that already includes, David Backes and Noel Acciari, and you can cut the team some slack, but this is where other players need to step up and fill in. Following the Wednesday (last night) game with the Avalanche, the Bruins’ weekend will consist of road contests with the Arizona Coyotes, Saturday at 9:00pm, and on Sunday in their first meeting with the newest NHL franchise, the Vegas Golden Knights in a 7:00pm start, before returning to TD Garden ice to host the Vancouver Canucks on Thursday, October 19 at 7:00pm. THE TRADITION – Mark your calendars as The Sports Museum offers up one of its signature events on Tuesday, November 28, at the TD Garden when they present their 16th Annual The Tradition. The lineup of honorees for 2017’s The Tradition, include Bruins legend and Lady Byng Trophy winner (1982), Rick “Nifty” Middleton, former Celtic, and two-time NBA Champion (1973-74, 1975-76), Dave Cowens, New England Patriot linebacker and three-time Super Bowl Champion (2001, 2003, 2004), Willie McGinest, tennis superstar Martina Navratilova, winner of the Wimbledon title nine times between the years of 1978 to 1990, and former Red Sox catcher Jason Varitek, whose achievements include two Word Series championships (2004, 2007), Gold Glove winner (2005), and a Silver Slugger Award (2005). Ashley Walenta at awalenta@sportsmuseum.org or call (617) 624-1231. 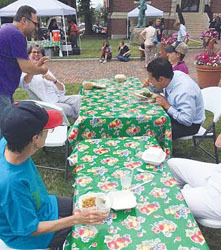 The initial Chelsea Lunch initiative kicked off on the City Hall Lawn on Wednesday, July 12, at noon, and was a hit. While rain threatened the event which takes place every week on Wednesday from noon to 2 p.m. – it held off and residents and business owners filed to the event. Downtown Coordinator Mimi Graney said it was a great mix of residents and area workers. Food provider Rhythm N Wraps sold out of their offerings by 1:30 p.m.
“There were more than a few smiles and folks said they were excited to attend again next week,” said Graney. The Chelsea Lunch Marketplace offers food, but also informational booths, small retailers and other amenities. The Chelsea High football team will be shooting for its first victory of the season Friday evening when the Red Devils host Northeast Regional Vocational School at Chelsea Stadium. Kick-off time is set for 7:00. Coach Jack Halas’s squad opened its 2016 campaign last Thursday evening at Lynn Tech and came up on the short end of a 34-0 decision. The contest started inauspiciously for the Red Devils, who were flagged for two false-start penalties to open the game that would prove to be an indication of Chelsea’s frustrations to come. Tech controlled the line of scrimmage on both sides of the ball, with the Tech offense piling up 293 yards on the ground. Senior quarterback and captain T.J. Patterson accounted for the bulk of the CHS offense, rushing for 40 yards on 14 carries and completing five-of-13 pass attempts for 64 yards in the air. Chelsea had opportunities to score on some deep balls, but the Devils were unable to secure the catch. Senior wide receiver and captain Nick Ieng hauled in two passes for 23 yards and picked up 25 yards on the ground. “Hats off to Lynn Tech,” said Halas. “They outplayed us start to finish. We are very young and inexperienced on the O-line and the D-line. No excuse, but I understand why we struggled. Only two players on our O-line have varsity experience. One D-lineman has varsity experience and we have to start two freshmen. earns 2-2 tie with NE. The Chelsea High boys soccer team scored two goals in the final four minutes to come away with a 2-2 tie against perennial Commonwealth Athletic Conference archrival Northeast Regional last Thursday at Chelsea Stadium. Northeast grabbed a 1-0 lead midway through the first half and enlarged its margin to 2-0 with a goal with 15 minutes left in the contest. The Red Devils had been controlling possession up to that point, but Chelsea was unable to find the right combination in the offensive third of the field. However, with four minutes to play and the Red Devils pressing, Northeast was called for a foul in the box, giving Chelsea a penalty kick opportunity. Kevin Umanzor-Torrez made good his shot, but the ref blew the ball dead, apparently for the infraction of a Chelsea player entering the box before Umanzor-Torres struck the ball. That meant that Kevin had to retake the shot, and once again he drilled it to the back of the Northeast net to close the gap to 2-1. The Red Devils resumed their attack ever more ferociously after the PK, and their hard work paid off with 90 seconds remaining in the game when a poor Northeast clear from the box was trapped and controlled by senior Humberto Suarez just outside the 18-yard line. Humberto then delivered a powerful strike that beat the NE keeper (who had played a superb game) to bring the Devils to level at 2-2. The Red Devils next hosted Everett, their former ancient foe from Chelsea’s days in the Greater Boston League, Monday evening. Although the fierce battles with their opponent from across the Parkway are only a distant memory for CHS fans over the age of 40, the schools have revived their rivalry on the soccer pitch in recent years, with the CHS-EHS games drawing the largest and most vocal fan attendance of the season for both teams. The schools have engaged in hard-fought and evenly-matched contests in recent years, but Monday’s contest saw Everett power to a 6-0 victory before a vocal crowd of partisans. The match was evenly-played through the first 40 minutes, with the Crimson Tide taking a 1-0 lead at the half. However, with Chelsea’s top defender, Carlos Cartagena, forced to the sidelines with a groin pull shortly into the second half, Everett soon began to take control, eventually striking for five goals in the final 25 minutes of the game. “Everett is a very good team that is almost exclusively comprised of seniors,” noted Protasowicki. “We already were missing two of our key players in Carlos Garcia and Carlos Cruz, so when Carlos Cartagena was injured, it left us pretty thin and Everett took full advantage. Head coach Mick Milutinovic and his crew, who now stand at 1-1-1 on the season, were set to host Whittier yesterday (Wednesday) and will trek to Lynn Tech tomorrow (Friday). The Red Devils are then off until next Friday. The Chelsea High boys and girls cross country teams opened their 2016 season against Parkway rival Everett last Wednesday on a hot, muggy day at the Admiral’s Hill course. The Lady Red Devils shut out their Lady Crimson Tide counterparts, 15-50, while the boys came up on the short end of a 19-36 decision. Finishing in second place was senior captain Melanie Nguyen in 26:18. Sophomore Jocelyn Poste took third spot in 27:19, followed by freshman teammates Sandra Tun in fourth place, Anna Bernal in fifth, and Karina Avalos in sixth. of the year,” noted Fay. The girls were set to compete yesterday at home (Wednesday) in a tri-meet with Presentation of Mary Academy and Whittier. Concord in 10th in 25:50. “The boys also are a pretty young team and hopefully in the next meet or two we will have everyone back and ready to run strong,” noted Fay. Bruins President Cam Neely took the media on a grand tour of the new grounds, stating “With this facility, the guys are very excited about it. The players that have been in here already are very excited about being in this space a lot more.” There wasn’t much not to like as the tour continued with a view of the players’ locker room, their personal relaxation area complete with a team logo ping pong table, a much improved workout facility, updated media workspace, and even an indoor track. Neely went on to explain his surprise that the Bruins were able to find space so close to TD Garden, let alone such a complete facility that would allow New Balance to accommodate the team’s multitude of needs. New Balance Managing Director Jim Halliday glowed when explaining the growing pains, and finally the reward, after two years of construction. Another plus will be the benefit to the community, with 75 percent of ice time already booked. Many youth hockey programs will also have the chance to skate on the Bruins logo-marked ice, certainly a thrill for youngsters of any age. Halliday went on to confirm that the Boston Celtics are also in the process of constructing their practice facility nearby Warrior. It confirms that the Bruins have certainly made a good decision to build in Boston Landing, as it appears to be a major sports development area. Halliday continued to explain that the MBTA is committed to building a commuter rail stop in the near future, making it a bit easier for fans all over to come and enjoy the exciting atmosphere of a Bruins practice. Asked why the Bruins logo was placed on the ceiling in the Bruins’ dressing room, as opposed to the floor rug at the Garden dressing room, Neely took great pleasure in explaining, “I could never understand why the logo was on the floor at the Garden, I wouldn’t even put my Bruins jersey on the floor, it just didn’t seem right, so it was decided that the ceiling was the better choice.” That brought a laugh from the media attending, as it was always a challenge when interviewing players at the Garden, that one had to be very careful to not step on the spoked-B, and be the recipient of a reprimand from staff! After touring the new facility it was obvious that the Bruins want even their new practice facility to be one that was comfortable for the players, and even more important, a place for conditioning that would keep them in the best shape possible. It appears that Bruins management have met that criteria head on, as the remarks from the players who’ve had the chance to inspect the facility agreed, it is one impressive building for both the players and the fans! Ash Back to City Manager? In Cambridge This Time? Numerous media outlets reported on Wednesday that State Housing Secretary Jay Ash – the former Chelsea City Manager – has made an application to become the next city manager of Cambridge, possibly leaving the cabinet post on Beacon Hill for the confines of Cambridge. Ash confirmed to the Globe on Wednesday that he has applied and is pursuing the job. Ash did not return a request for comment from the Record in time for publication. He was one of the first to join Gov. Charlie Baker’s administration in January 2015 and was credited with luring in and ushering in General Electric to Massachusetts earlier this year. He also concentrated on getting homeless families out of motels an into long-term housing situations – something that he worked on also while in Chelsea. Ash also told the Globe that his current job requires a lot of travel across the state and prevents him from focusing in on one community. Rather, he said, he is constantly rushing from one place to another listening to the needs of various locales. His expertise in drilling down on problems, as he did in Chelsea one by one, is not particularly as useful in his current position. The city manager position in Cambridge would also nearly double his salary, the Globe reported. Ash’s current salary is approximately $160,000, while the salary for the Cambridge city manager exceeds $300,000. A decision on the position is expected by the City Council in Cambridge this fall. Dwayne Seldon, 51, 28 Spencer Ave., Chelsea, was arrested for possessing Class B drug, resisting arrest, drinking/possessing open alcoholic beverage in public. Shirma Farmer, 63, 9 Lawrence St., Chelsea, was arrested for disorderly conduct, drinking/possessing open alcoholic beverage in public. Sherif Seweilam, 29, 435 Dorset St., South Burlington, VT, was arrested on a warrant. Raul Figueroa, 30, 14 Marie St., Dorchester, was arrested on warrants. Natalie Virella, 36, 317 Broadway, Chelsea, was arrested on warrants. Faisal Yerow, 20, 180 Central Ave., Chelsea, was arrested for breaking and entering nighttime vehicle/boat for felony (5 counts) receiving stolen property over $250, resisting arrest. Kenneth Powell, 27k, 67 Savanna Ave., East Boston, was arrested for assault to murder, firearm-armed, destruction of property over $250, malicious, discharging/firing firearm/bb or air gun in city, firearm, discharge within 500 ft. of building, firearm, carrying without license, ammunition without FID card, possess, threat to commit crime, witness intimidation. Laura Delmedico, 34, 26 Tufts St., Boston, was arrested on a warrant.